New Delhi : After the leaving his party, former railway minister and senior TMC leader Mukul Roy, joined the Bhartiya Janta Party (BJP) in New Delhi on Friday evening. Roy joined BJP in presence of union minister Ravi Shankar Prasad and calls ‘secular’ to the party. He also told that it is proud for him that he will now work in the leadership of PM Narendra Modi and BJP president Amit Shah. 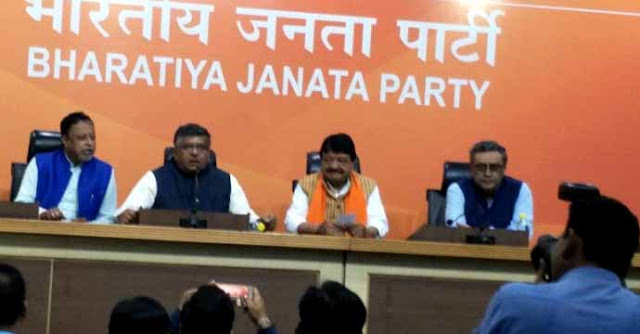 Union Minister for Law and Information Technology Ravi Shankar Prasad, BJP general secretary in charge of West Bengal Kailash Vijayvargiya and Rajya Sabha member Swapan Dasgupta welcomed Mr. Roy into the party fold. After the ceremony, he met party president Amit Shah and Railway Minister Piyush Goyal for photo-ops. On this occasion Mukul Roy said to media persons that, "I sincerely believe that the Trinamool Congress would not have grown as it did without the support of the BJP. In 1998, when the TMC fought the polls for the first time, it was with the support of the BJP, and again in 1999, it was a part of the NDA and joined the government of Atal Behari Vajpayee." Roy further added that, "I’m proud to work under leadership of Prime Minister Narendra Modi and BJP president Amit Shah, and I believe that the BJP is secular. The people of Bengal are looking for an alternative and the BJP will soon be in power in the State as well." Along with him, Ravi Shankar Prasad also said that, "We are sure that the entry of Mukul Roy will be a benefit of the BJP. His experience will benefit us immensely."